I invented this dish for a dinner party guest, a French teacher who was pregnant. She loved it. Other guests did as well, so I have made my Pink Lemonade Chicken for many buffet dinners. Now, I am inspired by my dear nieces and nephews who are expecting babies soon, so I am publishing this recipe again. The ingredients are simple and few, and you may adjust the amounts according to taste. Poach chicken breasts in a mixture composed of 2/3 of a 16-ounce can of frozen pink lemonade juice and two or three cups of water. When it is thawed, the pink lemonade turns to thick syrup. One large can will be sufficient for four-to-six pounds of chicken. Reserve a third of the can for a final sauce. Cover the boneless, skinless chicken breasts and simmer slowly in the pink lemonade for an hour or more. You may add salt or celery salt, but remember, this dish is created for those with delicate stomachs, so please don’t add garlic or onion flavorings. 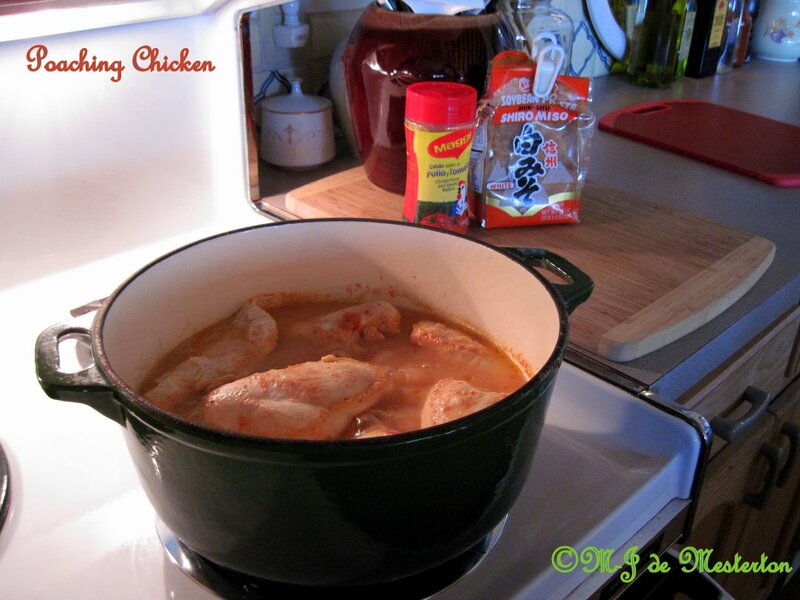 The liquid will reduce and the whole pieces of chicken should become lightly browned. Remove from heat and place on top of two sheets of waxed paper to protect your cutting board. When the chicken breasts are cool, slice them into medallions–see my example in the photo below–with a very sharp knife. The liquid left-over in the poaching pan will be used to make a sauce. Into the pan, pour 3/4 cup of water and a teaspoon of cornstarch, which has been mixed with a tablespoon of water. Add the 1/3 can of remaining pink lemonade syrup. Cook till it becomes a sauce. Pour some of it on the base of your serving dish. Arrange the slices of chicken in a circular fashion. When you have finished arranging the chicken slices, drizzle the rest of the pink lemonade sauce over them. Poached chicken in a lettuce salad, with fresh lemon and vegetable oil dressing, ground green peppercorn and salt–how elegant and health-promoting it is. I would have made Chicken Jubilee from Beverly Barbour’s book, “Secret Recipes from Private Clubs,” but I had no tomato. I did, however, use a green pepper from my garden to replace it. This simple chicken salad is a refreshing dish for summer luncheon. Add water and the flavouring of your choice to boneless chicken breasts. Here I have used miso and a little Maggi chicken and tomato bouillon powder. Simmer for forty minutes, cool and freeze for future use, or slice and use with sauce or gravy. I will return at the next opportunity with an original recipe or two, employing poached chicken breast meat.